In Science Friction, best-selling author and Skeptic magazine publisher Michael Shermer pretends to be a psychic for a day … and fools everyone; as a psychologist and bicycle racer Shermer reveals the science behind sports psychology; as a historian and evolutionary theorist Shermer considers what was truly responsible for the mutiny on the Bounty; and as a son, Shermer explores the possibilities of alternative and experimental medicine for his cancer-ravaged mother. 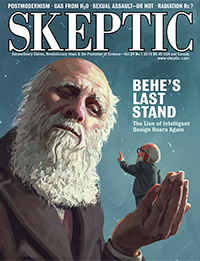 And a skeptic realizes that it is time to turn the skeptical lens onto science itself. In each of the essays in Science Friction, Shermer explores the very personal barriers and biases that plague and propel science, especially when scientists push against the unknown. What do we know, and what do we not know? How does science respond to controversy, attack, and uncertainty? When does theory become accepted fact? You may disagree with Michael Shermer, but you’d better have a good reason and you’ll have your work cut out finding it. He describes skepticism as a virtue, but I think that understates his own unique contribution to contemporary intellectual discourse. Worldly-wise sounds wearily cynical so I’d call Shermer universe-wise. I’d call him shrewd, but it doesn’t do justice to the breadth and depth of his inspired scientific vision. I’d call him a spirited controversialist, but that doesn’t do justice to his urbane good humor. Oh just read the book. Once you start, you won’t stop. From breast implants to Captain Bligh, Michael Shermer examines the way we humans perceive news and history. He’s given a lot of things a lot of thought. If your perceptions have ever rubbed you the wrong way, you’ll find Science Friction fascinating.